Layers allow to set which objects are to be displayed. For example, you can create an Interface layer for all the objects in the interface and a Base layer for the rest. This way you can move the camera around the Base layer without affecting the interface. 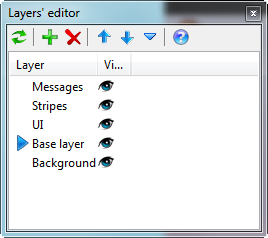 The Layer Editor can be opened from the Scene Editor ribbon. From there you can add, remove and move layers from the toolbar. The layer currently selected is highlighted with a blue arrow: objects added to the scene will be added to the selected layer. Double-click on a layer to edit it, and on the eye to hide/show it. The Edit layer window allows you to change the layer name and the camera behavior. By default, a layer only has one camera of standard size (the game window size) covering the whole window. You can add another camera by clicking on Add another camera and choosing the camera to display in the list. The area where a camera is rendered on the screen is called the viewport. The first coordinates represent the viewport top-left corner, and the second pair of coordinates the bottom-right corner. The values need to be between 0 and 1: they are then multiplied by the window size. In the picture above, the top-right corner coordinates are three quarters of the total screen width and three quarters of the total screen height. With a resolution of for example 1024×768, that corresponds to point (768, 576). The bottom-left corner is the same as the monitor bottom-left screen, so in our example (1024, 768). As explained in the Concepts section, remember that the Y-axis increases from top to bottom, and the origin is in the top-left corner. You can also change the size “filmed” by the camera by checking Personalized size.